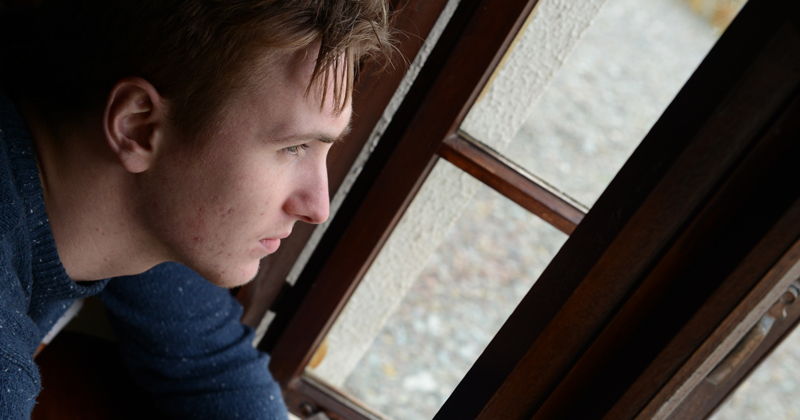 PAC-UK's Education Service have developed a range of resources to support families, schools and local authorities in meeting the educational needs of adopted and special guardianship children. PAC-UK and Adoption UK have published two complementary education guides, for school staff and adoptive parents respectively, to help ensure adopted children get the best possible educational start in life. PAC-UK’s guide for school staff 'Meeting the needs of adopted and permanently placed children: A guide for school staff' covers a range of topics including: what we know about our children in education, a background to early developmental trauma, whole school approaches, and support for schools and families. Adoption UK’s guide 'Meeting the needs of adopted and permanently placed children - A guide for adoptive parents' includes information about Virtual School Heads (VSHs), Designated Teachers (DTs), Priority School Admission, Pupil Premium Plus (PP+) and dedicates two pages to Intercountry Adoption and Schools. These guides and resources were published on 19 October 2017. You can read the joint PAC-UK & AUK press release in full here. 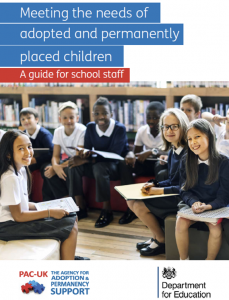 Based on research conducted by PAC-UK, this guide will show school leaders how to develop their adoption-friendly policies and practice, with photocopiable and printable resources. Identifying eight key areas for improvement such as staff training and communication with families, it is applicable to all school settings. Purchase of the book provides access to an online toolkit, a bank of resources, templates and policies to help schools on the way. The book’s launch took place on 15 May 2017 at the Royal Society of Medicine. Becoming an Adoption-Friendly School will also be available to schools as a six day course, spread across the school year, from September 2017. The course will run in London and Leeds. 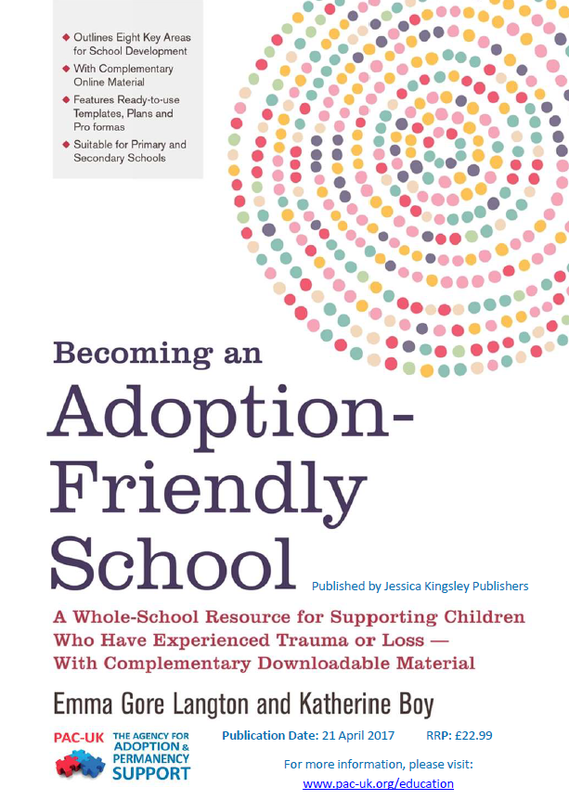 Our Adoption Friendly Schools Charter which accompanies the book can be downloaded here and can be freely used by schools to communicate their efforts and journey towards becoming adoption friendly. Published in 2013, our Good Practice Guide for Schools has sold over 4,000 copies. 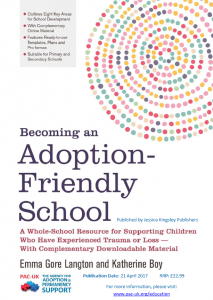 A Good Practice Guide for Schools - Understanding and Meeting the Needs of Children who are Looked After, Fostered, Adopted or otherwise Permanently Placed costs £10 for one copy and £7.50 each for multiple copies. PAC-UK is a charity and a donation towards the cost of postage and packing would be appreciated. This is a handy guide for schools and families on effective use of the Pupil Premium Plus. Our booklet for adoptive parents and special guardians explains educational processes and school systems, for those who may not have recent experience of the education system. Adoptive parents and special guardians often tell us that they would like help in identifying the most suitable school to meet their children’s needs. In consultations with families, we have identified some key questions to ask schools when you visit them. Included in the appendix of the Good Practice Guide for Schools, this document provides a framework for adoptive families, children and young people to share important information about the child’s strengths, needs, triggers and support preferences. Some children find change difficult. Adults can help support children manage change by scaffolding the process and supporting the child’s emotional well-being. The adults around the child may want to consider using a transition plan to help with the process. We are often asked about activities and resources to help children say goodbye at key transition points. We have put together some suggestions, which you can view here. We know that school trips can sometimes feel dysregulating for children. Here are some ways families and professionals have shared with us which can help. We have compiled a list of suggested reading about adopted children’s educational needs for schools, families, education and social care professionals. You can download this here.